I received an e-mail advising that there would be Arc Style printed patterns available on special offer at Amazon.UK. I often browse the Arc Style site and decided to check out the sale offerings. 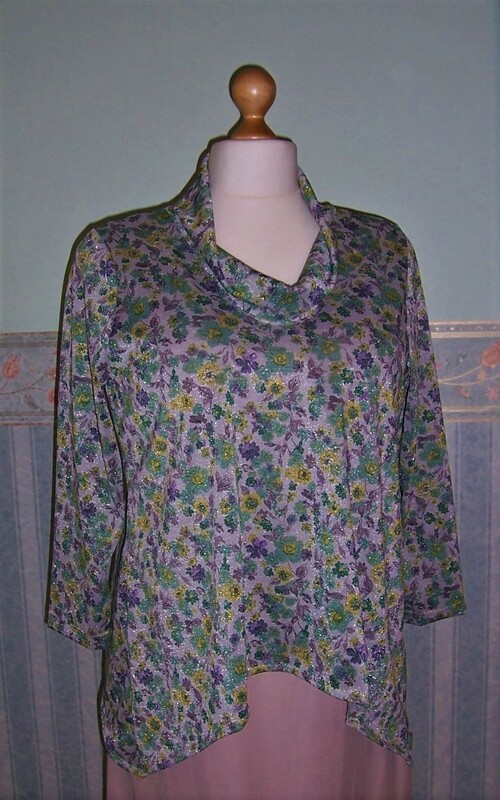 I was particularly interested in the Amy design as this has a handkerchief hemline combined with a cowl neckline, two style ideas that I have been wanting to try for some time. The printed pattern arrived yesterday and today I made a ‘wearable toile’ of the design. 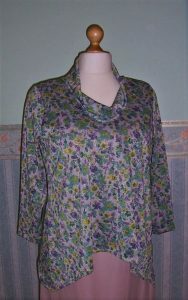 I used roughly 2 yards of 60 inch wide ‘shimmery’ printed jersey bought in June from Minerva Crafts for £8.97. It was an interesting experience. The pattern is printed on good quality paper and having checked the measurements, I reduced the sleeve length by 3 inches. Other than that I made no changes to the size 22 pattern. Seam allowances are only ¼ inch which means there is no wastage but you do need to be careful when clipping the notches. The pattern markings are sparse and in the case of the collar, some are missing. The text on the collar is particularly confusing, as there is no layout diagram I cut two of the pattern piece before realising that only one is required. The construction information is also very basic. 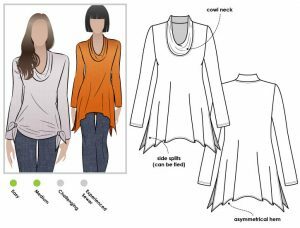 The text for applying the cowl collar to the neckline differs from the diagrams which for a beginner dressmaker would be very confusing. Fortunately, I now consider myself to be of intermediate level when sewing with jersey fabric. 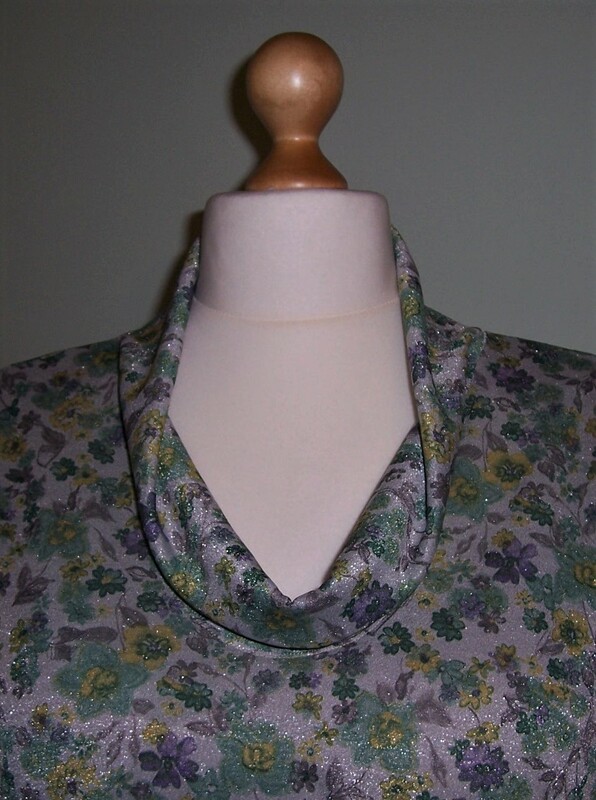 I ignored the written instructions and applied the collar in the same way that I would a neckband, i.e., stitched the centre back seam then folded in half wrong sides together and attached to the neckline with the overlocker. The seam allowance was then machined down on the outside with a row of stitches 1/8 inch from the original overlocked seam. The sleeves were inserted flat before the side and sleeve seams were stitched in one go. I did not leave the side seam hem vents as I particularly did not want the sides ‘flapping about’. I turned up the sleeve hems by 1 inch and stitched with a twin needle. The sleeves are now at 7/8 length which suits me fine. The bodice hem was turned up by 1/2 inch and stitched in place with a twin needle. Overall the fit is good except that once again by not making a full bust adjustment, the front bodice is pulled up so next time I will add to the front hemline. 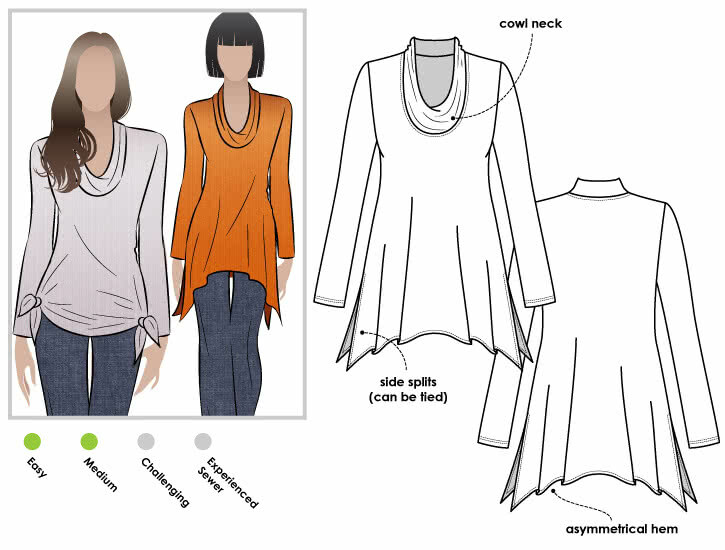 Having read the pattern reviews I must agree that the cowl neckline is nowhere near as full as the drawing suggests. I shall re-draft a cowl that is closer to the one offered in New Look K6412. The top will look good over plain Black trousers, ideal for a casual evening out over the Festive Season. I have approximately 1 metre left to make a basic tee top-I might try a hack of the bodice of Butterick 6754 which has the lovely raglan sleeves.